The last we had a full-length album from Florida's Seven Kingdoms was a little more than four years ago. But the band has been busy recently. They crowd-funded a four song EP, In The Walls, this past fall. Encouraged by that success, Seven Kingdoms reached out to their fan base once more to crowd-fund their latest and fourth album, Decennium. Marking the tenth anniversary of the band, the album will be released in limited amounts of hand numbered and hand signed CDs (1000) and vinyl (250). Note the awesome album artwork from Serbian digital artist Dusan Markovic. Find more at his Deviant Art page. 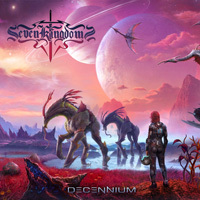 As for Seven Kingdoms' Decennium, there's no mistaking their sound: pure melodic power metal. Actually, the band is an ocean removed in their genre. Seven Kingdoms could have easily arrived from Germany, Sweden, or Italy, as they easily echo their European power metal brethren. But I don't think that's an accident by any means when you consider their influence found on their Facebook page. At the core of the 7K sound is twin guitar harmony and leads, Sabrina Valentine's soaring heavy metal vocals, and a galloping and sturdy rhythm section. And when I say galloping, I mean it: Seven Kingdoms puts the proverbial speed into their power metal. There may be slight modicums of slower pacing here and there but, otherwise, Seven Kingdoms charges from the gate right from the start and doesn't slow down. Check your metaphors when you push play. This is bullet train stuff. Additionally, if you're crazy for guitar hero fret pyrotechnics, you will find massive amounts of blistering guitar solos within this album. And these solos are as swift as the song pacing, like Dragonforce speedy. As for the songs, two come from the EP, Undying and In The Walls, with an additional eight songs to complete the long player. In the description of the Seven Kingdoms sound, I pretty much gave away all the elements within every arrangement. Suffice to say, or add once more, every song is guitar-forward, big on a wall of riffage and an abundance of solos. Guitar harmony weaves together with solid melodic vocal harmony as well, making Seven Kingdoms' power metal the perfect storm of melody, speed, and heaviness. Some favorites: Stargazer, Castles In The Snow, Hollow, and Awakened From Nothing. Honestly, with Decennium, Seven Kingdoms easily nails pure melodic power metal in its best and most traditional form, some killer stuff and easily recommended. With Decennium, Seven Kingdoms easily nails pure melodic power metal in its best and most traditional form: some killer stuff and easily recommended.